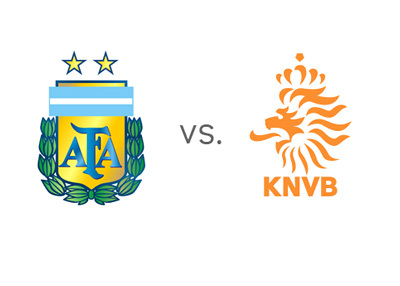 Argentina and Netherlands meet in the semi-finals of the 2014 FIFA World Cup on Wednesday, July 9th at the Arena de Sao Paulo. Argentina topped Group F with victories over Bosnia & Herzegovina (2-1), Iran (1-0) and Nigeria (3-2). They continued their run with an extra-time elimination of Switzerland (1-0) and most recently, a win vs. Belgium (1-0) in the quarter-finals. Although Argentina won all their games with just one goal difference, Lionel Messi & Co. have looked good so far in the tournament and are, at the time of this writing, the favorites to win the World Cup. On Wednesday, Alejandro Sabella, the team coach, will not be able to count on the services of Angel di Maria, who injured his thigh muscle in the game against Belgium, while Sergio Aguero, who missed the last two matches with a hamstring problem, is under a question mark. The 2010 finalists, Netherlands, started the tournament with a thrilling 5-1 victory over Spain and continued on to win Group B after beating Australia (3-2) and Chile (2-0). In the knockout rounds of the competition, Netherlands beat Mexico 2-1 and most recently Costa Rica in a penalty shootout after a 0-0 draw. Netherlands look solid in all aspects of the game, especially up front where Arjen Robben is relentlessly terrorizing the opposing defenders. It should be noted that the team's manager, Louis van Gaal, has made couple of exceptional, game-winning decisions in this tournament so far, the latest of which is the 120th minute goalkeeper substitution vs. Costa Rica, which possibly earned the Oranje a place in the semi-finals. Argentina are the slight favourites to win, according to the odds. The winner will play either Brazil or Germany in the World Cup final.